MINNEAPOLIS (AP) — Progress this season for Minnesota in the standings was marginal, with one more win by the Gophers than in coach P.J. Fleck’s first year to gain bowl-game eligibility. That extra victory sure felt like a major stride, though. Bunyanesque, even. Instead of handing in practice gear to the equipment staff and giving goodbye hugs to the outgoing seniors this week, the Gophers get to extend their season. The way they did it, with a stunningly lopsided 37-15 win at Wisconsin on Saturday to stop a 14-game losing streak in the longest-running series in major college football, was the kind of one-day performance that has the potential to spark a decade-long improvement. 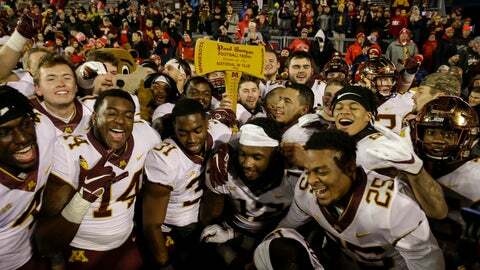 From that late-night meet and greet with fans to the field trip to U.S. Bank Stadium on Sunday by a handful of players to show off the axe to the crowd at the Green Bay Packers-Minnesota Vikings game, the Gophers have justifiably been having their share of fun after finally ending the run of frustration against the rival Badgers. With a sharp decline in attendance this year at TCF Bank Stadium and a freshman-laden lineup that bottomed out with a 55-31 loss at Illinois on Nov. 3, the mood surrounding the program three weeks ago was decidedly less upbeat. Defensive coordinator Robb Smith was fired, and the Gophers won two of their last three games while allowing a total of 49 points. The Gophers are still just 11-13 under Fleck, with a 5-13 record in Big Ten play and a 2-8 mark on the road. With 51.7 percent of the roster either redshirt or true freshmen, however, the Gophers have the highest number of rookies in the FBS. All four of their touchdowns against the Badgers were scored by freshmen: two by running back Bryce Williams and one each by running back Mohamed Ibrahim and wide receiver/punt returner Demetrius Douglas. If the offense with seven freshmen starters put up 37 points at Wisconsin, imagine what a more seasoned team might be able to do in 2019. “This is what the process is all about. This is just the start. This is not the end. We’ve got a lot of work to do,” said Fleck, whose teams at Western Michigan finished 1-11, 8-5, 8-5 and 13-1. The three most likely postseason destinations are the Quick Lane Bowl in Detroit on Dec. 26, the SERVPRO First Responder Bowl in Dallas on Dec. 26 and the New Era Pinstripe Bowl in New York on Dec. 27. “I’m so excited that we get one more shot at this,” defensive end Carter Coughlin said.